Our WindSAVER XL brackets are the ideal choice for pole banners 30″ x 72″ or smaller. 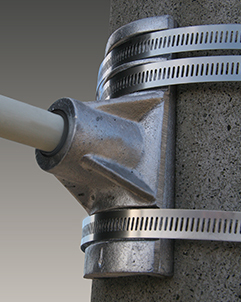 Designed with small profile poles in mind, this system features 0.812″ diameter fiberglas rods expoxied into the rod holders and is easily installed using our three band system. Parts list for WindSAVER XL Single Bracket. Parts list for WindSAVER XL Double Bracket. View WindSAVER XL install instructions PDF. 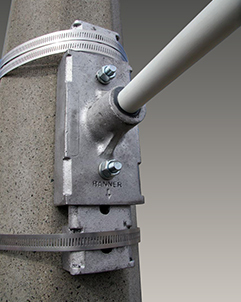 Our BannerMASTER brackets feature a dual-plate system that allows your banners to be tightened and adjusted on pole without removing the plates or loosening the screw bands. The rod holder, in tandem with the slotted back plate, can be vertically adjusted up to 2.5″—this makes normal maintenance an easier task and saves the cost of replacing screw bands or steel banding/buckles. 0.812″ diameter fiberglas rods are epoxied into the rod holders. Parts list for BannerMASTER Single Bracket. Parts list for BannerMASTER Double Bracket. View BannerMASTER install instructions PDF.